Some of this is possible with MacVim, but I’d rather do as much as possible in a platform-independent way. So, command-line Vim it is. I think the best way to install Vim plugins is via Tim Pope’s Pathogen. Using that plugin, you can simply clone the VimRoom repository into your bundles directory, and you’re done. Without Pathogen, installation is almost as trivial: simply copy ./plugins/vimroom.vim from the repository into your plugins directory. That’s it! By default, VimRoom binds <Leader>V to <Plug>VimroomToggle, and sets up an 80 column workspace with at least 5 columns of space on either side (it doesn’t help at all to have single-column sidebars, you see), and 3 lines of space above and below. It assumes a black background when hiding visual distractions. As of v0.4, VimRoom also sets up a :VimroomToggle command that has the same effect. Changing any of these assumptions is a simple matter of setting variables in your .vimrc. 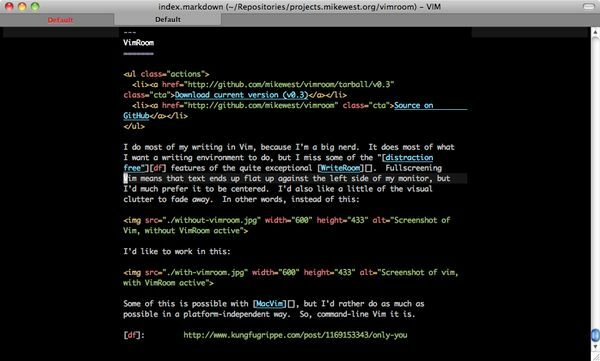 g:vimroom_min_sidebar_width is the minimum sidebar width. This will automatically expand to take up all the free space left after setting the main workspace window to g:vimroom_width columns. g:vimroom_navigational_keys determines whether Vimroom will map keys like <Up>, <Down>, j, and k to navigate over “display” lines, rather than “logical” lines. This defaults to 1 (on), if you’d prefer the mapping not take place, set it to 0 (off). g:vimroom_scrolloff specifies how many lines of text ought appear before and after the cursor. This defaults to 999, which centers the cursor on the screen. 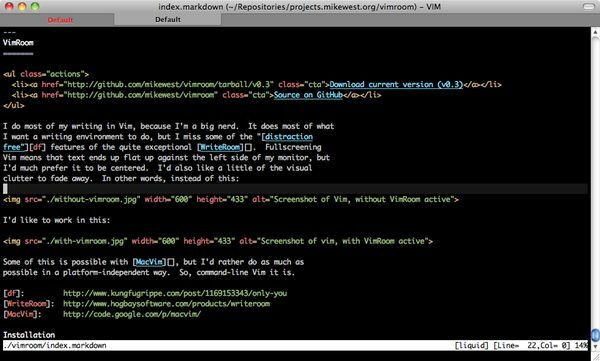 g:vimroom_sidebar_height sets the height of the upper and lower “sidebars.” If you don’t want vertical padding, set this to 0.
g:vimroom_width is the width of your workspace. Would bind the function to <Leader>mz. Trivial, right? Fixed Issue #2 by adding a new g:vimroom_navigational_keys option to enable users to determine whether navigational keys ought to be mapped as navigating over “display” lines instead of “logical” lines. I also wrapped the mappings in a try/catch block, just in case. Changed navigation mappings in Vimroom mode to move over wrapped lines as they’re displayed on the screen (“display lines” in Vim vernacular) as opposed to the default navigation over hard line-breaks (“logical lines”). These mappings are only implemented if j/<Down> and k/<Up> aren’t already mapped to something else. Explicitly setting textwidth when toggling Vimroom. Turning off display of cursorline in the various padding windows. Fixed nasty bug in insert mode for the navigation mappings that were added to v0.5. Adding a :VimroomToggle command that has the same effect as the <Plug>VimroomToggle mapping. Vertical padding is available now via the g:vimroom_sidebar_height configuration option, which defaults to 3 lines. Fixing the g:colors_name bug that FND found. Adding g:vimroom_scrolloff to configure the number of lines that must be shown before and after the cursor (using the built-in scrolloff setting). Defaults to 999, which centers the cursor on the screen if enough lines are available.